Measurements required, please call us at (866) 563-6812 for measuring estimate. 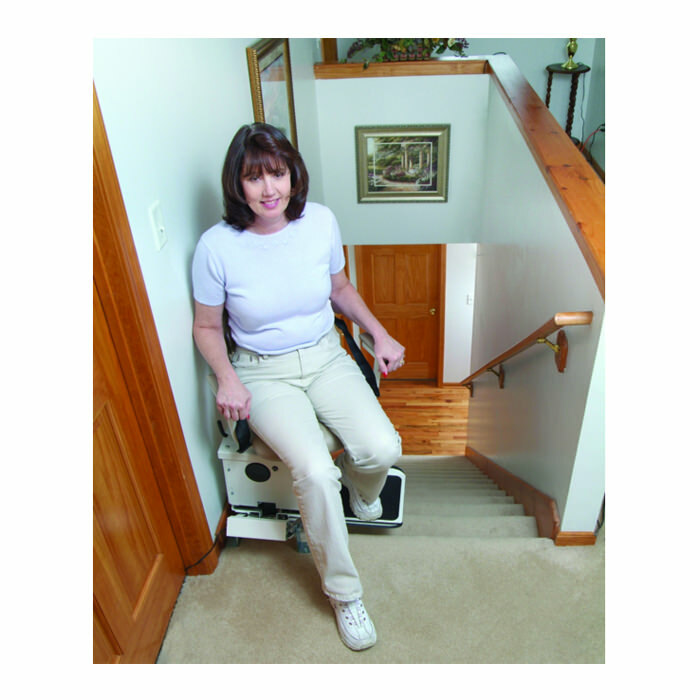 Harmar Summit straight indoor stair lift - SL350AC is designed for long-term indoor use and has weight capacity up to 350 lbs. 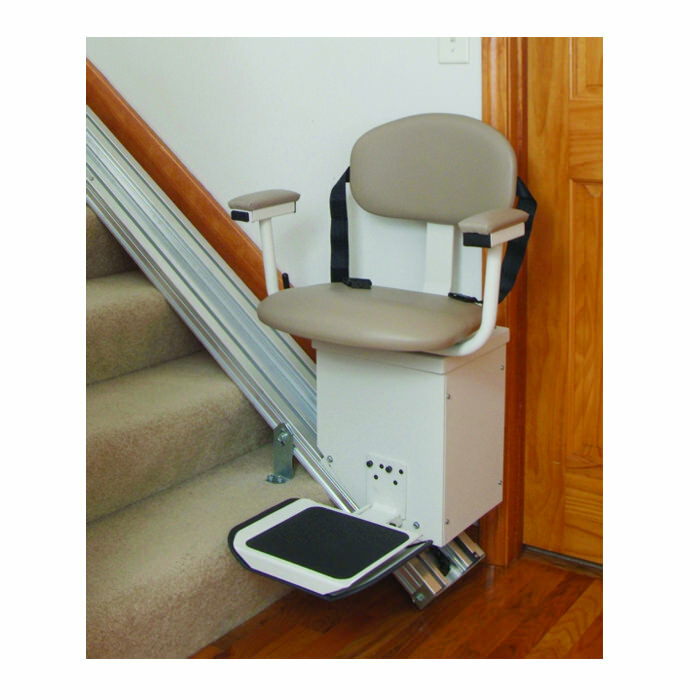 SL350AC indoor AC straight stair lift is engineered with carriage that is pre-installed on a short section of the durable extruded aluminum track. The backrest has three different settings, and the fold-up footrest adjusts to two different heights for the utmost in custom comfort. Power Indicator Light - AC powered units - This small green light at the top of the track indicates power is on to the unit. If it is not lit, the unit will not run. This is generally the result of a blown circuit breaker. The circuit breaker is located under the light and is resettable. Charger light - battery powered units - This small light located on the charger gives you a constant picture of the charger’s operation. A green light indicates the batteries are completely charged. A reddish/orange light indicates the charger is charging the batteries. Should there be no light—or the light is continually flashing, contact the factory. Unit control switch - This is a rocker switch located on the front of the arm rest. It must be pushed and held during the entire travel of the lift. Pushing one side moves the lift up, the other side moves the lift down. The lift will automatically stop when it reaches the end of the track or anytime you release the control. 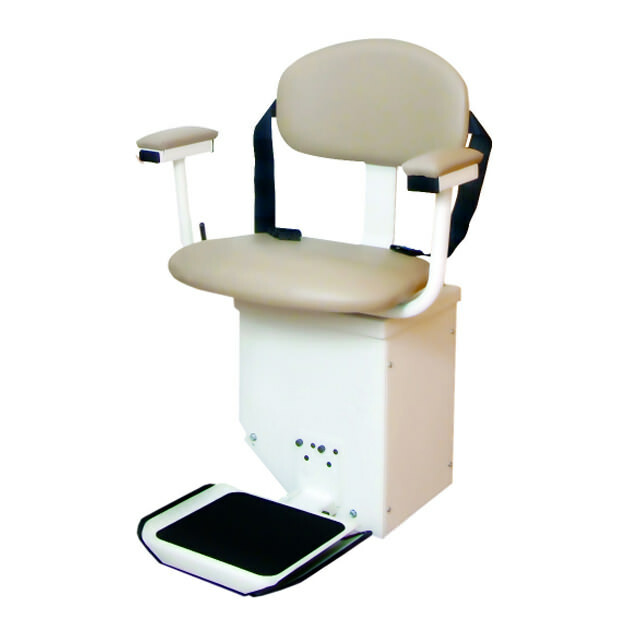 Swivel seat - The seat swivels at the top and bottom landings to facilitate getting on and off the lift. To swivel the seat, pull up on the handle on either side of the seat and use your body to turn the seat in the direction desired. Make sure the seat locks before attempting to mount or dismount the lift. Returning the seat to its forward, locked position before operating the lift is very important. A safety switch under the seat prevents the lift from moving unless the seat is forward and locked in place. Seat belt - A seat belt is provided to keep you firmly in the chair during the travel of the lift. Never operate the lift until the seat belt is fastened securely around your waist. Obstructions - Always check the stairway and track to make sure there are no obstructions before traveling up or down the stairs. Never operate the lift if anything or anyone is on the stairway. The footrest is equipped with a sensor to stop the lift if it should strike anything. If this happens, push the unit control the opposite direction to move away from the obstruction. Landing controls - A remote control is provided at the top and bottom of the stairs. Pressing the control will bring the lift to you. The lift will stop automatically when it reaches the end of the track. It will also stop if you release the control. Clear distance between armrests 19"
Floor to seat height low / high 20" - 24"
Minimum wall to stair side of rail 10"
Backrest height from top of seat 14"